iPhone Blue Screen of Death? Fixed! 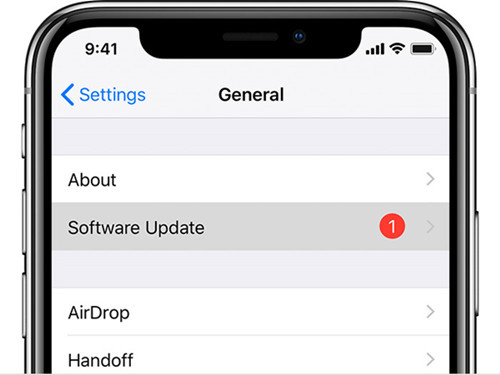 Many users have complained that they always encountered some display issues when using their iPhones, and blue screen of death (BSoD) is just one. There are some possible reasons that cause this problems such as failed iOS update, software bugs, apps overload, multi-tasking or damaged hardware, etc. No matter what the reason it is, you must be desperate to repair it to normal. This guide will cover 3 solutions to help you fix iPhone blue screen of death problem. For iPhone 8/8 Plus, X and later, quickly press and release Volume Up button at first, then quickly press and release Volume Down button and then press and hold the Side/Power button till the Apple logo appears. If a hard reset doesn't work, you can try restoring your iPhone to factory setting. But by doing so, all the settings and content on your device will be erased. 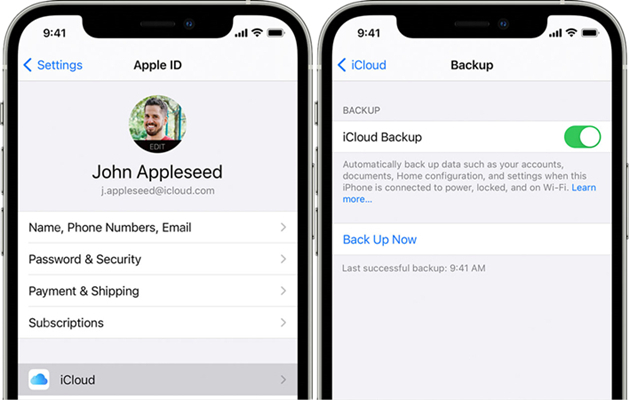 Please make sure you have already made a backup for your data before using this method. Step 3: iTunes will detect your device in the recovery mode, if not, you can close it and open it again. Then a box will pop up and ask you to "Restore" or "Update" your device. Press on the "Restore" button to factory reset your iPhone. When it finishes, your device will be a new one and your BSoD problem will be solved. 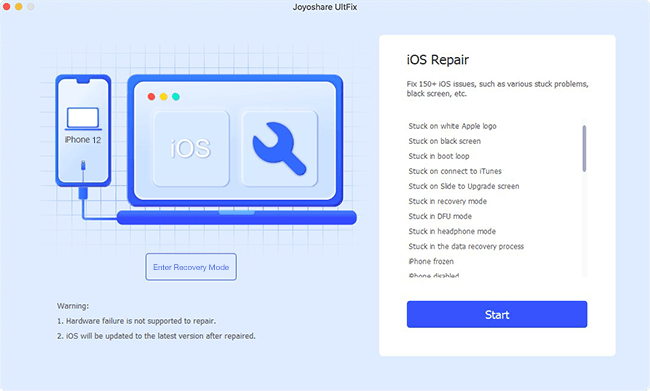 There are a lot of tools you can use to fix iPhone BSoD problem, and one of the most reliable programs is Joyoshare UltFix iOS System Recovery. This is by far considered as the easiest way to fix iPhone screen disaply problem like this. Besides BSoD problem, other screen issues such as red screen, black/white screen of death as well as some iOS problems like iPhone won't turn off, iPad keeps restarting, stuck on the circle loading screen, etc. can also be resolved by using this powerful iOS repair software. 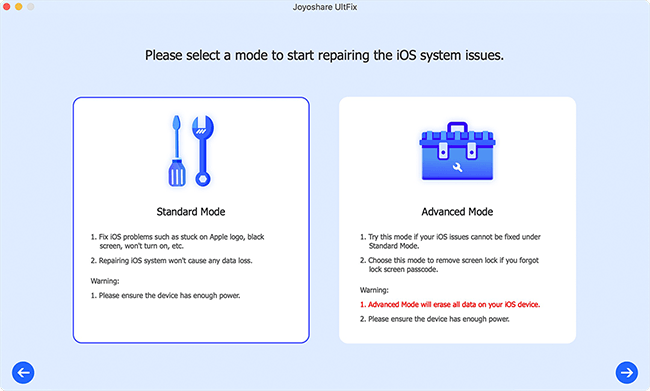 The most important part of Joyoshare UltFix is that it offers two recovery modes, and you will never lose any data on your device under the Standard Mode; while the Advanced Mode will solve all those serious iOS problems. 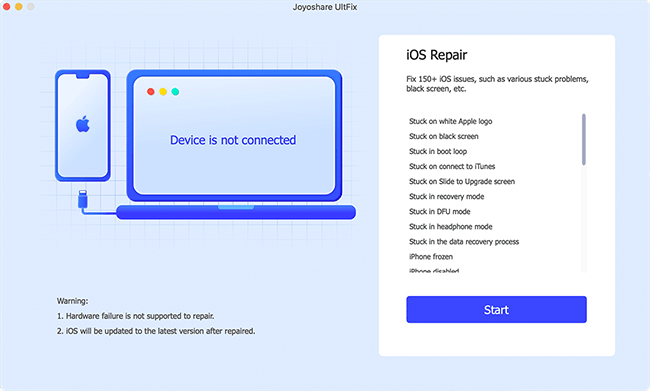 Here is how to use Joyoshare UltFix to fix iPhone blue screen of death problem. Use a USB cable to connect your irresponsive iPhone to the Mac or PC. Open Joyoshare after completes installation. Joyoshare will detect your iPhone automatically. Then press on the "Start" button to start. Next you can choose one recovery mode between Standard Mode and Advanced Mode. The former allows you to fix various common iOS issues without data loss while the latter will erase all the data on the device. Here you're suggested to choose the Standard Mode. Then follow the onscreen instruction to place your iPhone into the recovery or DFU mode. Or, you can simply one click the "Enter Recovery Mode" button on the main interface. 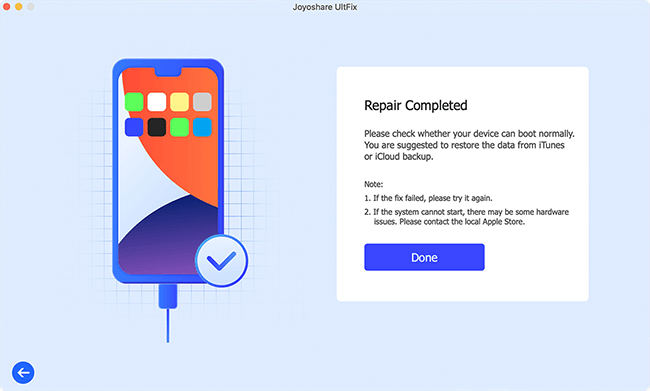 When your device entered the recovery or DFU mode successfully, you should check your device info first and then press the "Download" button to download and verify the firmware package. Once the downloading and verifying come to an end, you can click the "Repair" buttton to start fixing your iPhone blue screen problem. If the problem still exists, you can try the "Advanced Mode" to fix it. If you're using an old iOS operating system on your device, it may cause iPhone BSoD problem. You can update it to the newest version right now. Step 3: Wait until the update process is finished. After that, your iPhone will be restarted. Step 2: Turn off the "iCloud Drive" sync option.